Add Bucket Loads of Functionality to Your Tractor. Durable KIOTI front end loaders feature a heavy lift capacity and greater lift height, so you can tackle any job with confidence. KIOTI KL loaders and larger are equipped with a skid steer compatible quick-attach mounting system that makes bucket attachment smooth and effortless. 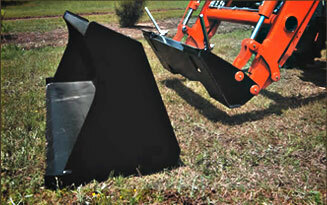 A loader equipped with a quick attach plate can use a variety of attachments, like bale spears and pallet forks.